Axiomtek's NA-330 low power 1U rackmount network appliance with ten Gigabit LANs supports dual core Intel Atom processor D525 at 1.8 GHz with Intel ICH8M PCH chipset. The NA-330 supports two high bandwidth DDR3 SO-DIMM slots with memory up to 4GB. 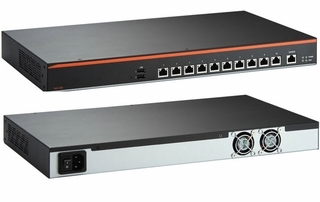 For greater flexibility, the NA-330 is available with either ten Gigabit Ethernet ports or eight Gigabit Ethernet ports plus two SFP based fiber ports. To help with unexpected shutdowns, our network appliance supports two-group LAN bypass function through WDT and GPIO pin definitions. The platform uses today's Intel Hyper-threading Technology to advance CPU performance and throughout. Axiomtek's NA-330 is an ideal solution for network applications in VPN, firewall, UTM and more.